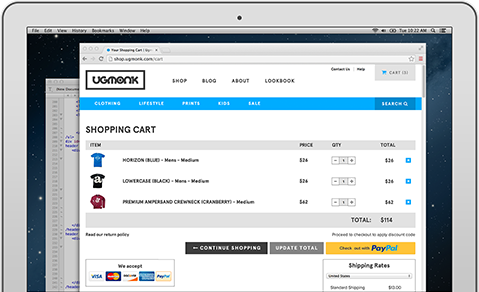 With Website Payments Standard, you integrate our payment buttons into your website to turn it into an online store. Your customer checks out through the PayPal site, then we return them to your site. Customers add items to your shopping cart and are taken to a PayPal payment page. They choose to pay by card or log in to PayPal where they can choose from their linked cards or bank accounts. They enter or select their shipping address, confirm the payment and return to your site. Your checkout is mobile-optimised with Website Payments Standard, no matter how your website is set up. Customers using smartphones can complete their payment quickly and easily. To integrate Website Payments Standard, just complete our form to generate your button, then copy and paste a few lines of code into your site. The easiest way to set-up with Website Payments Standard is with a shopping cart. If you already have one or are working with an eCommerce provider, it’s likely that our payment buttons are already integrated with their solution. All you’ll need to activate them is your PayPal login or PayPal API credentials. It’s just 2.6% + $0.30^ per sale, with no monthly fees. As your sales volume increases, you can become eligible for lower rates. ^For domestic transactions, excluding payments from international cards. PayPal’s Seller Protection policy safeguards your eligible sales. If you’re sent an unauthorised payment (for example, from a hacked account) or a buyer claims they didn’t receive their item and you can provide proof of shipment, we’ll protect you for the full amount of the payment. Payment Card Industry (PCI) security standards are minimum requirements for protecting your customers’ card information. PCI compliance is required for all merchants that touch, store, transmit or process credit card details. Website Payment Standard takes your customers to a PayPal-hosted checkout page which means you never see their card information. Can I use Website Payments Standard to sell internationally? Yes. When you use Website Payments Standard, your international customers can pay you with PayPal, their credit card or debit card. Need help with Website Payments Standard? Our Developer Centre provides useful information and tips for setting up, set-up guides and answers your technical questions. Need help with your PayPal business account? Open a PayPal account to get started with Website Payments Standard.